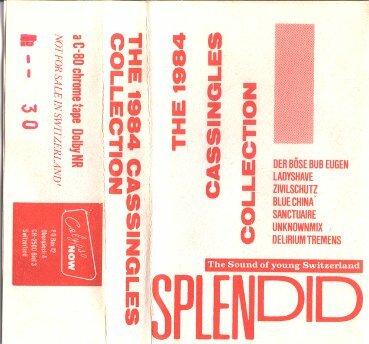 "Calypso Now Cassingles 'Splendid - The Sound Of Young Switzerland' came out in winter 1984 in a series of seven cassettes, neatly packed in covers LP-sized designed by Martin Schori. This sampler has been made up for sale in other countries, as the postage for one original cassingle is pretty expensive, due to their size and weight." From the cassette cover. Limited edition, each copy numbered. From original analog master to fresh cassettes. A3 	Der Zivilschutz  -  	Gibt Es Dich? About the bands: 'Der Lange Mann' was the first minor hit by Der Boese Bub Eugen, who were kind of the thinking girl's fun punk band. Ladyshave were three punk teddies from Zurich with Enzo Esposito, who later became a famous comedian. Blue China were certainly the most prolific band on the sampler, led by Rudolph Dietrich, who was the first swiss punk to have a major label contract (and to lose it almost immediately again, which resulted in his single 'No Claim With Bluff And Swindle'). A great supporter of young bands and a great musician! Delirium Tremens were three skinhead punks from the Jura mountains, luckily they are here with four songs (instead of two like the other bands). It was their only release, and it's a real shame, they would have been a fantastic single band! Sanctuaire and Zivilschutz were local wave bands who never really made it, the one being gloomy and dark, the other more upbeat and synthetic. Zivilschutz had a cult following among early techno lovers, and one can hear why that's so. They were quite special, mixing synths with a trombone!